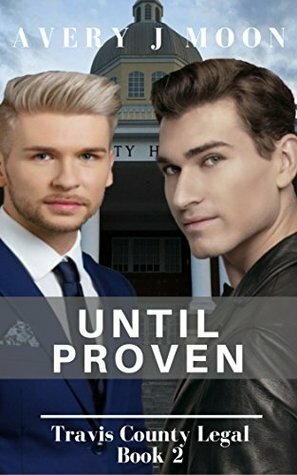 Until Proven Review ~ Well-constructed plot … 10 out of 10! Cover Art: Two young men, one blond, one dark haired, looking outwards in front of a civic building which fits with the plot. The author’s name and book title appear in white in a large clear font. Synopsis: Is well written and accurate without giving too much away. States this is a slow-burning MM Gay romance although there is no specific warning of adult content. Plot: A rookie attorney is given a cut and dried case of embezzlement in which the defendant is a transgender woman. With the help of his friends he discovers evidence which clears her and meets the prosecuting attorney to present his evidence. There is an instant spark between them and as they work together to build their case against the true culprit their relationship grows on a personal as well as a professional level. Main Characters: Willard Drake, the rookie attorney in his father’s firm, Drake Law. Joshua Penbrook, young prosecuting attorney. There is a spark between them as soon as they meet for the first time. Roberta Huff, transgender client, who is falsely accused of embezzlement. Secondary Characters: Jazlyn, Joshua’s friend who is also helping Willard with his case. Max the computer whizz who discovers the proof which clears Roberta. Tyrone Russell, Roberta’s boss who does not like having a transgender person on his staff. Numerous other characters appear who contribute to the story. Flow/Continuity: The story flows seamlessly from one scene to another. Each chapter is headed with the appropriate scene. There were no continuity issues. Conflict & Climax: The conflict builds throughout the story as the team try to prove who is really responsible for framing Roberta. The climax comes when the court hearing arrives and the real culprit appears on the stand. Writing Style: The story is told in the third person. Avery has an easy to follow and flowing style. Editing/Formatting: The book is well edited with no errors that I could see. Formatting is neat with tidy margins and no superfluous whitespace, chapters are numbered in a large upper case bold font and also sub-titled with a heading. Each chapter begins on a new page. Price: At £2.24 $2.99 this is reasonably priced for the length of story. Conclusion: I really enjoyed this story. There was always something happening and the pieces interlocked seamlessly to form the complete picture. I have to give this a 10* mark just because the story is well constructed. Previous Adrian’s Bodyguard Review & Spotlight ~ 9 out of 10! Next Second Chances Review ~ A perfect holiday story … 9 out of 10!